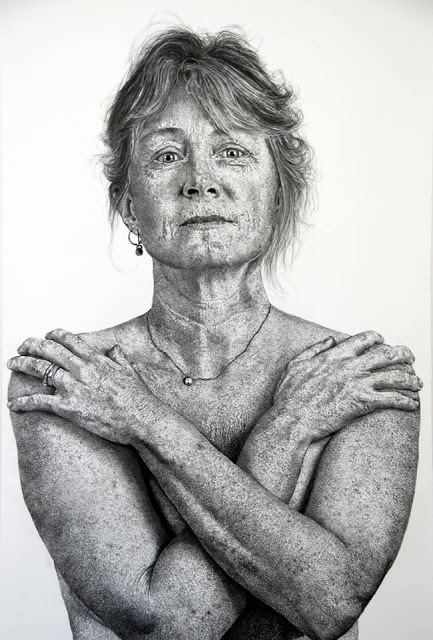 The triennial Outwin Boochever Portrait Competition winners are on display the National Portrait Gallery in Washington DC, and readers will undoubtedly recognize work by friends and colleagues. 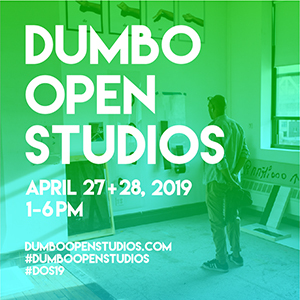 Of more than 3000 submissions, 48 pieces were selected, including a remarkable large-scale drawing by Ray DiCapua, a faculty member at the University of Connecticut. Although the official competition winners have already been selected, the museum is encouraging participation via phone app in the People’s Choice Awards through September 21. Ray DiCapua, Marie, charcoal on paper, 60 x 84 inches. Working in charcoal on paper, DiCapua’s portraits are finely detailed, hyper-realist images of specific individuals. At his website, DiCapua writes that looking inevitably gets entangled with interpretation. When I pay careful attention, I notice that many of the ways that I am drawn to interpret my personal and social world—as products of socialization—is at odds with my actual experience. I am interested in bringing this schism into view. To make specific features of our socially constructed world visible is to present opportunities for choice. I am interested in how images can inform and inspire self-reflective awareness and dialog about personal and cultural narratives, identities and worldviews. Through these large charcoal/ink drawings, I explore the interplay between interpretation, recognition, meaning and experience. I look to both evoke and disrupt possible patterns of interpretation. In so doing, I hope to jar awareness into noticing the constructed qualities of how we see, respond to and therefore create and recreate our world(s). Marie, the woman depicted in the portrait selected for the NPG exhibition, is DiCapua’s wife. As her husband, I have a distinct vantage on the lifetime of experience comprised in her complex gaze. Yet making this drawing also challenged me to explore aspects of her that extend past my direct experience. 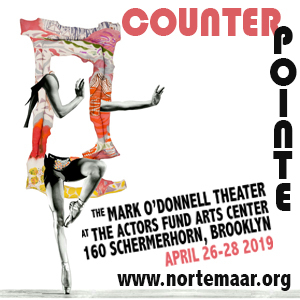 Marie is a conflict specialist in the field of international development. Her accounts from volatile, struggling places in our world are embedded in the fragile interplay of recognition and charcoal marks. 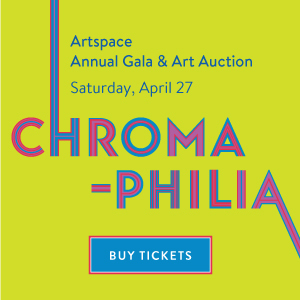 Other notable painters in the competition include Tim Doud, Beverly McIver, Anne Harris, and Bo Bartlett. 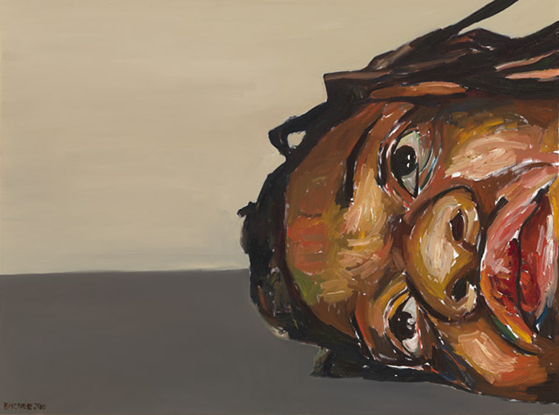 Beverly McIver, Depression, 2010, oil on canvas. Collection of the artist, courtesy Betty Cuningham Gallery. McIver is a 2012 resident at the Marie Walsh Sharpe Foundation Space Program in DUMBO. Bo Bartlett, Inheritance, 2010, oil on linen. “Inheritance is a portrait of my parents. I painted it from life in the living room of my childhood home in Columbus, Georgia. My father was a furniture designer and woodworker. My mother was a medical librarian. One of my first memories is of my father critiquing a drawing I did of a clown juggling. He said I’d drawn it ‘wrong’ because I didn’t have the balls in the ‘right place.’ There are fallen juggling balls on the floor of the portrait. The upturned chair suggests my mother’s silent suffering during domestic struggles. 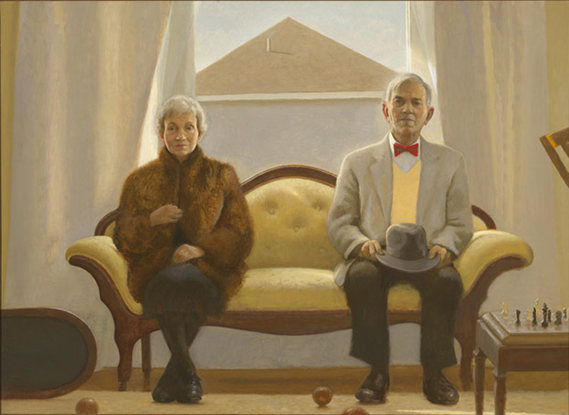 Tim Doud, Room and Board, 2010, oil on linen. “If portraiture is about identity, my portraits are about how identity is fabricated; that is, in our Facebook world, how an identity is largely an act of presentation: visible in the ways we appear or describe ourselves— race, class, and sexuality, and gender—and shaped by what a particular culture deems acceptable. Identity, then, varies constantly as we prepare ourselves for different publics. My work explores the presentation of selves that we call “the portrait.” In this respect, the portrait means what it shows: the craft of the work, the individual’s presentation. 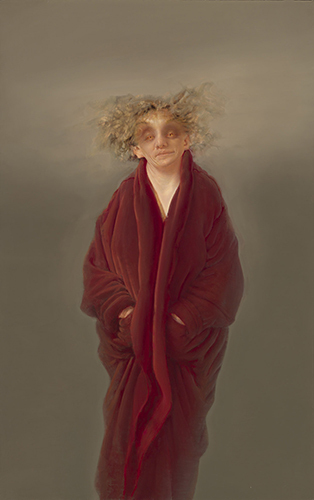 Anne Harris, Portrait (Red Robe), oil on linen, 2008–12. Collection of the artist, courtesy Alexandre Gallery. 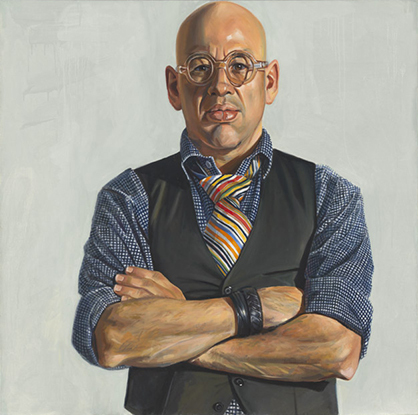 “The Outwin Boochever Portrait Competition 2013,” National Portrait Gallery, Washington, DC. Through February 23, 2014. Don’t forget to download the phone app and vote for the People’s Choice Awards before September 21, 2013. I like Beverly McIver's "Depression". Great piece. The rest, whatever. Agreed. McIver's piece has real power and presence. The others are hack work, competent but boring and imitative. DiCapua's writes like an academic. It's literally meaningless, art-speak drivel. Almost as torpid as his work. "Hack work"? "Imitative"? "Torpid"? Can't we at least show a little respect for craft, patience, and careful observation? Since Saurat and Jones have declined to give links to their own websites, we have no idea what type of work they might consider worthy. Potshots like this are unfair and indefensible. I couldn't agree more with Sara. The comments of Jones, Saurat and Smith are inaccurate, silly and uninformed. I don't see McIver's work as especially better, in fact, if I were to be hypercritical I would call it a bit cornball and exploitive. This is me, now it's your turn. Put up or shut up. I don't think McIver's work is cornball or exploitive at all. The others have more of a standard approach and don't use the portrait format in an interesting way. Nicely done perhaps, but not memorable.